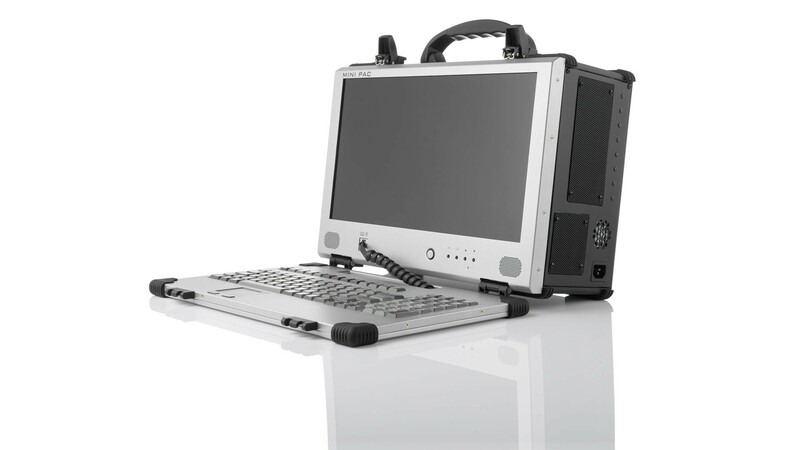 MilPAC III Fully rugged, transportable, deployable workhorse for C4ISR / C5ISR, GIS and geospatial applications MilPAC The ideal portable GIS / Weapons Training platform. MilBOX Fully rugged, embedded server with milspec connectors for harsh environments. Sherlock Lite Our entry-level computer for digital forensics with a single integrated write-blocker. Sherlock 4:4 Complete and portable digital forensics workstation capable of 4-to-4 parallel duplication and analyses. SMK Single-rail industrial rackmount KVM with 1x, 8x, or 16x KVM switches. RMDDU 17 2U rack mount 17" dual-screen LCD with 2 ports. RMDDU 17A Dual-screen rack mount, ideal in areas with limited space. RMDDU 19 2U rack mount 19" dual-screen LCD with 2 ports. RMDDU 23 2U rack mount dual-screen command & control display. RMTDU Triple-screen, single-rail industrial rackmount KVM. BCCD Robust and portable triple LCD display. QED 2000 12 Lead ECG Recorder that provides extremely accurate ECG signals. What is a Portable Computer? As the name implies, think of the MiniPAC as a miniature portable workstation. It is geared toward users who require a very portable computer with a lot of storage but not necessarily the best graphics. It comes with a 15.6" LCD at a resolution of 1366x768. Out of all our portable computers, the MiniPAC has the smallest width and height at 15" and 10" respectively. With 3 expansion slots and up to 16TB of storage, this small portable computer is able to be configured to certain applications while holding a massive amount of storage. As the name implies, the MiniPAC is very compact. In some fields, a large LCD and high resolution may be unnecessary. In this instance, the MiniPAC becomes a very viable option as it is lightweight (approximately only 16.5 pounds) and compact. The MiniPAC supports up to 16TB of storage. Despite its small size, it is still able to hold massive amount of storage with 8 2.5" hot swappable drive bays. Its 3 expansion slots also allow this portable computer to be configured for specific applications, particularly in the network analysis field. Max Dimensions (L x W): 12.28" x 5.39"
High performance rugged portable computers that outgun everything else out there. Copyright © 2019 Acme Portable Machines, Inc. All rights reserved.